The building that houses the present Laura Ashley, at 41 and 42 High Street, was for many years the premises of Hinton Lake, the chemists. The building, largely dating from 1564 was called the Mansion House up until 1740. It is a twin-gabled, timber-framed, four story building with cellar, while its façade and some of its interior still survives. The timber joists of the façade are a modern restoration, replacing a rendered front sometime in the early 20th Century. It was constructed on a much older site and part of the wall that was built in 1285/6 to create Cathedral Close, runs through the basement. A 14th century fireplace was discovered in the early 20th century, which was restored. In the 16th century, the risk of fire was great in plaster and lathe buildings, and the merchants in 40 and 41 High Street (left side in photo), built a thick firewall between the properties. The building was said to be used by Judge Jeffreys during the Bloody Assizes to impose the will of James II on the West Country rebels who had supported the Duke of Monmouth's rebellion, and his attempt for the throne, in 1685. During the late eighteenth century a boot maker traded from the shop and from 1825, a clock maker. From 1839, Thomas Knott a chemist and druggist traded from the premises, after he vacated premises on the opposite side at 220 High Street, where Queen Street was later cut. By 1862 the business was in the hands of Mr Charles Ham, who would also thrive as a chemist in the city. John Hinton Lake was born in Exeter in 1845, the son of William Caperon Lake, a tailor in Castle Street and Jane Hinton. At the age of 24, John married Ellen Neck in St Sidwells and the couple had seven children. The young John Lake took over the business of Mr Ham the chemist in December 1868 – he may have trained with first Mr Knott and later Mr Ham. Once on his own, he thrived and the Pharmaceutical Society of Great Britain awarded John Hinton Lake the silver council medal in August 1873, indicating a growing reputation. He is listed living at his shop as a pharmaceutical chemist in the 1881 and 1901 census. The business, expanded over the years and branches were opened in Gold Street, Tiverton and Sidmouth. Hinton Lake was elected in January 1897 as president of the Exeter Association of Chemists and Druggists. The business was carried into the next generation by Hinton Lake's eldest son, John W Lake (born 1870) who was to become a keen early photographer and was, in 1908, the Honorary Secretary of the Exeter Camera Club. He was involved with the Exeter Pictorial Record Society and contributed several photographs of some of the almshouses of Exeter to the collection. When he retired, his son Roland Lake took over the shop. Further branches in Seaton, Beer and Sidford were eventually opened. 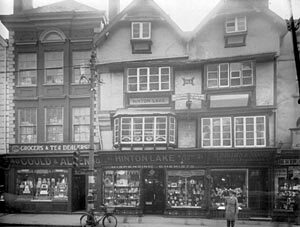 Shops in the High Street were far more varied than now - W G Hoskins noted that in 1919, there was William Gould, a grocer that opened in 1803, that became Gould and Allen, grocers and tea dealers in the photograph, on one side of Hinton Lake and Brown and Sons, florists and fruiterers on the other. 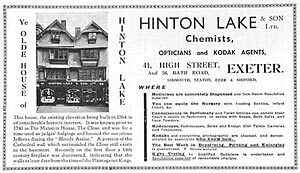 To give an idea of the range of services Hinton Lake provided Exonians, a 1933 advert offers medicines, nursery supplies, perfume, and optician services. John W Lake's early interest in photography meant that the shop was one of the first suppliers of photographic equipment and film and offered an 8 hour developing and printing service for what was becoming a popular hobby. As early as 1913, the business provided a cinematograph hire service, and in 1933 they sold Ensign Cine Talking Cameras which was only four years after the talkies were invented. In 1971, Roland Lake retired and the business was sold to Holman, Ham & Co. The premises became Star Jeans for a time before Laura Ashley occupied this ancient and historic shop in 1984. An archeological survey at the time uncovered late sixteenth century wall paintings and fire places, and a garderobe (toilet). It is now a Grade II* listed building. Sources - Flying Post, 1881 and 1901 Census, Bill Douglas (University) website and my memory. 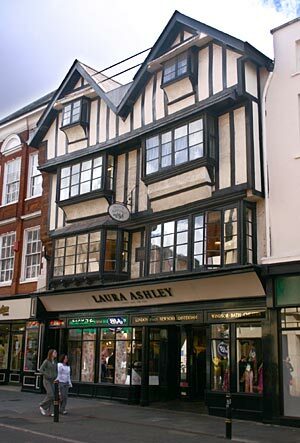 Laura Ashley in 41 High Street. The shop between the wars. City Council Parks Department An advert includes services as an opticians and as a Kodak agent.